I don't know about you, but sometimes I just don't have the time to take my car to a garage for an inside and outside wash and clean. I mean, it can take hours and I just don't have the time available to do that much any more. Case in point; I'd been meaning to get my wife's shopping trolley cleaned (inside) for literally months. The problem being it wasn't very high on my importance list, and I didn't want to spend a couple of hours on the weekend getting it done when I could be spending that time with my family. 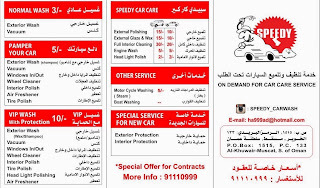 Step in this amazing service that I remembered Darren from Hi FM posting about a few months ago: Speedy car wash. 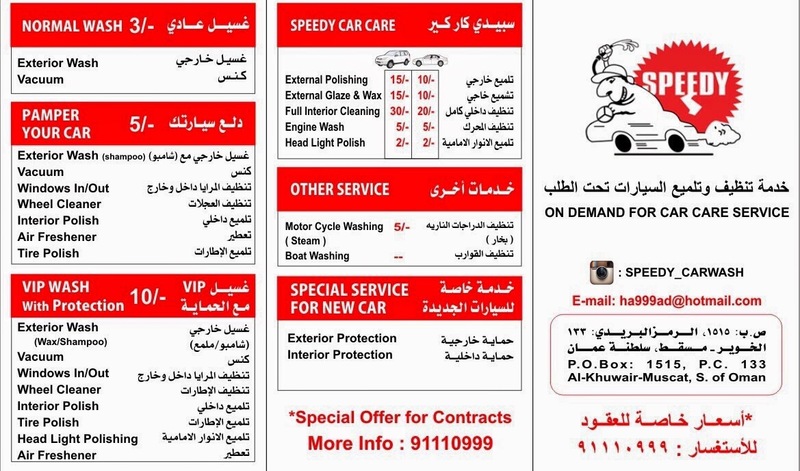 The service was great - I just WhatsApp'd Mohammed on 9111 0999 and asked if he could come and clean my car, he sent the price list above, and I sent him my location via WhatsApp, along with my specific address details and his team arrived the next day to do the job. They bring everything with them, even water to power their pressure washer and steam cleaner - all they ask is for a power cord to be plugged in to power their equipment. I left them to it, and asked them to wash my car as well - and a couple of hours later they were done, both motors looking a lot better than they did before - and I didn't even have to leave my house. I was very happy with the service and even happier that I didin't have to leave my house - they do all sorts of services for cars and I will certainly be asking to come back again and again : I'm never going to take my cars to a garage for a inside and outside wash again. I was actually about to give her tea set a wash as it was looking a bit grubby and then thought... this will help me. Some of us didn't get the fulfillment from our vehicle, in the wake of spending much expense on its enumerating and care we didn't improve execution due to the incorrect method for consideration and specifying. The Sacramento cheap mechanic is the just a single individual who will give you the privilege prompt and enlightening you regarding the privilege redesigning highlight which increment your vehicle execution.